The relationship between the physical availability of alcohol in society, the ease and convenience with which it can be obtained, and levels of alcohol consumption and harm has been explored in a large number of research studies from different countries. Strong evidence shows that increasing access to alcohol through more outlets and longer trading hours affects a range of alcohol-related harms. Overall, the evidence suggests that restricting the availability of alcohol can contribute to a reduction in alcohol-related problems. The sale of alcohol in Scotland is regulated by the Licensing (Scotland) Act 2005. Licensing controls the total number and types of outlet permitted to sell alcohol, as well as opening hours and conditions of sale. The licensing system exists because there is a consensus in society that alcohol is not an ordinary commodity. The role of licensing is to manage the retail provision of alcohol in such a way as to minimise the risks of harm to individuals and society from its use. 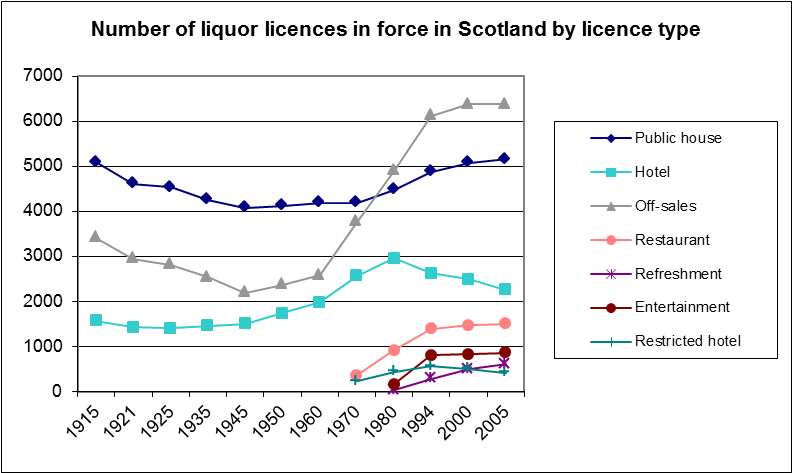 The Scottish licensing system has developed over many years. Historically, licensing has been concerned with the intoxicating effects of alcohol and the maintenance of public order and has consequently focused on the activities of the on-trade – pubs and more recently night-clubs. However, growing knowledge of the role of alcohol in a wide range of acute and long-term disorders, and a greater understanding of its negative social impacts, has increased the demand for licensing to regulate availability in a way that addresses the full spectrum of alcohol-related harm. Furthermore, growing awareness of the role of off-sales and home drinking in driving consumption has led to calls for stricter regulation of the off-trade. In June 2011, SHAAP and Alcohol Focus Scotland convened an expert workshop to consider the operation of Scotland’s licensing system and how it could more effectively regulate the availability of alcohol to reduce high levels of harm. New Scottish licensing legislation came into force in 2009. The new legislation introduces licensing objectives, including an objective to protect and improve public health. A key question for the workshop was how this public health objective could be meaningfully interpreted in licensing practice. The findings and conclusions of the workshop were published in the report, Re-thinking Alcohol Licensing.